Weicon Aqua Repair Stick is a simple option for making fast yet lasting repairs in wet, damp or submerged areas. This special type of epoxy putty will bond to wet surfaces which makes it ideal for repairing things that can’t be dried off (such as a leaking tank). This ability to bond to wet or damp surfaces is further augmented by the fact that Aqua Repair Sticks bond well to a wide variety of materials including metals, hard plastics, glass, ceramics, stone (e.g. marble, sandstone) and more. Weicon Aqua Repair Stick is manufactured in Germany from special epoxy resin which is filled with ceramic particles. They are a two-part epoxy putty but, thanks to the special design, are very easy to use and require no special measuring. The one tube contains both parts so all you need to do is cut off the amount you require, knead it and stick. Pot life for Aqua Repair Sticks is 15 minutes and, assuming normal working climate, will achieve handling strength (35% of final) after about 30 minutes. When fully cured it will be white in colour and withstand ongoing exposure to temperatures between -50°C and 120°C (or up to 150°C for an hour or two). Repair, crack filling, hole filling and recondition of components in the marine sector. Not sure if this is the right type of repair stick for you? 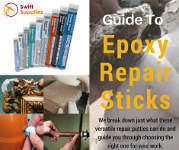 Our comprehensive Epoxy Repair Stick Buying guide goes through all the differences between the grades, explains where they are typically used and shows you how to use them. Does it shrink while curing? Only a very tiny bit. Linear shrinkage is less than 1% during the curing process. What do I cut bits off with? Pretty much anything. Really, a butter knife will do the trick here. One thing worth remembering, since pot life is so quick make sure you just cut off and knead the amount you’re going to use immediately. Also, be sure to clean your cutting tool as quickly as possible as parts of the putty can stick and cure on it. Not for this particular grade. That said, there are other types of Weicon Repair Sticks that may be suitable and these are different colours (e.g. Copper, Stainless Steel). Weicon Aqua Repair Stick can also be painted once it is fully cured. No. Being an epoxy resin based product, every type in our range of Weicon Repair Sticks are dielectric and have a dielectric strength of 3kV/mm according to ASTM D149 testing. What if I don’t use the whole pack? That’s fine. Just make sure you only mix the amount you need. Pot life doesn’t start until the two components are mixed which is why you need to cut off and knead just the amount you are going to use. It is suggested that any remains have their little foil cover put back over the end, be placed back in their tube, and be kept in the fridge if at all possible as this will extend the life of the product. *Performance will vary depending on the exact type of plastic being bonded. Generally, low surface energy plastics will be much harder to bond to then high surface energy (such as rigid PVC). For more information, including instruction for use, please consult the TDS and SDS for this repair stick which are both located on the media tab.